Coniferous swamps and borders of bogs, moist or swampy mixed forests, especially where there is birch, thickets along streams; less often in rich hardwoods, such as beech-maple forests, and floodplain forests. 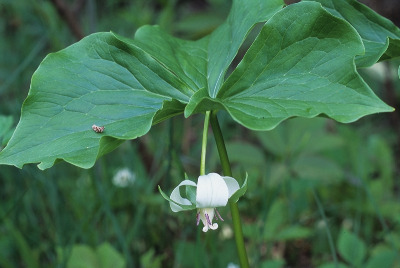 This is the common nodding white trillium throughout Michigan; only in the southern half of the Lower Peninsula is T. flexipes more frequent. In one small area of the eastern Upper Peninsula, plants occur with color variation from white through maroon (f. tangerae Wherry), similar to the color variation noted under T. flexipes. This color variation seems suspiciously like the result of hybridization with T. erectum, which, even more suspiciously, has been found in the Upper Peninsula only in this area. MICHIGAN FLORA ONLINE. A. A. Reznicek, E. G. Voss, & B. S. Walters. February 2011. University of Michigan. Web. 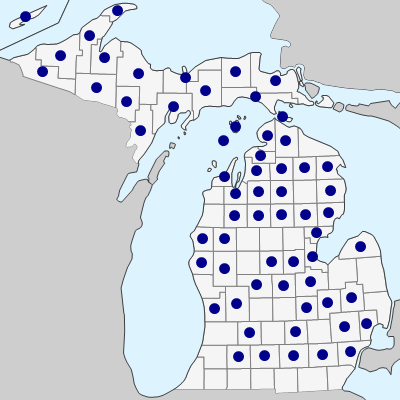 April 20, 2019. https://michiganflora.net/species.aspx?id=2728.